Ready for my closeup, Mr DeMille! This week's prompt from Sally Russick at Studio Sublime is "Take Time." I thought about how to portray this concept... taking time out of my busy life just for me. And I realized that it's not such an unusual thing for me to do. Because my kids are grown, and I don't have a physically active job, time for me might be taking a walk with my dog, Bebop or in the warmer weather, joining my husband on a yard sale expedition. I got my inspiration for this week's prompt from one of the items I picked up last summer. We saw an ad on Craig's List for a variety of items including old construction and furniture remnants. And the farm holding the sale was right up the road from our house. I walk past it on my walks. Around back are some greenhouses, and in one of them, they had what was left from a relative's furniture restoration business. Ooo lala! French antiques! However the antiques looked more like the piece you see here, made into a pendant, than anything you could sit on. I did buy several of these pieces, but there was something much bigger calling to me from a dusty corner. I walked by it several times, and finally pulled it out to take a second and third look. Yup, just as I thought - completely useless. But I had to get it. I had to take TIME for me. 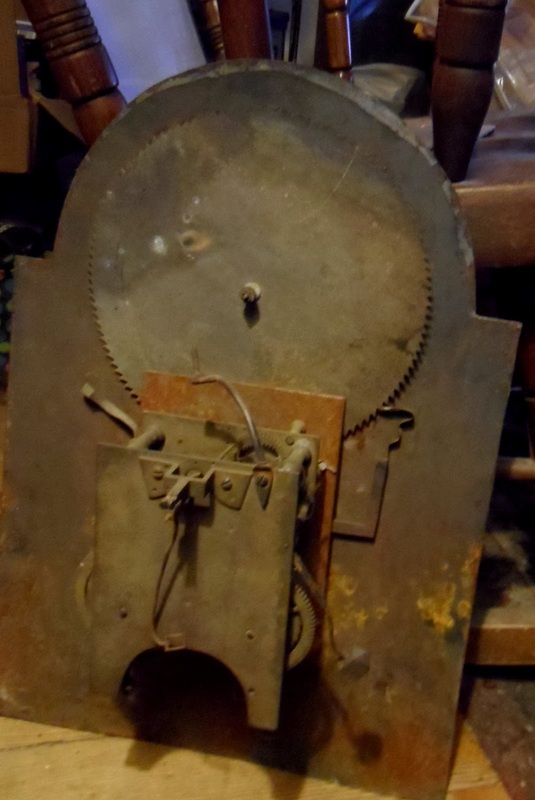 This object, so rusty and dusty, just barely recognizable as a former time piece, was once part of a grandfather clock. Now it sits in my living room reminding me to TAKE TIME. Go visit Sally's blog and meet the rest of the photographers. What a wonderful post Beti!! I love the rusty and dusty time piece you found and I bet it looks great in the living room!! The photo of the farmhouse is wonderful to bad it didn't have wonderful old french furniture in there, maybe next time! Wonderful photos. It is always great to find a treasure like your clock. I am so glad you enjoy it. Oh very cool, Beti! My Dad had a grandfather's clock with a face like that...I hope someone somewhere is still loving it as well as he did. GREAT pictures...love the one of the front, with the rust detail. Beti, I have to say I just love your dog's name: Bebop! So cute! 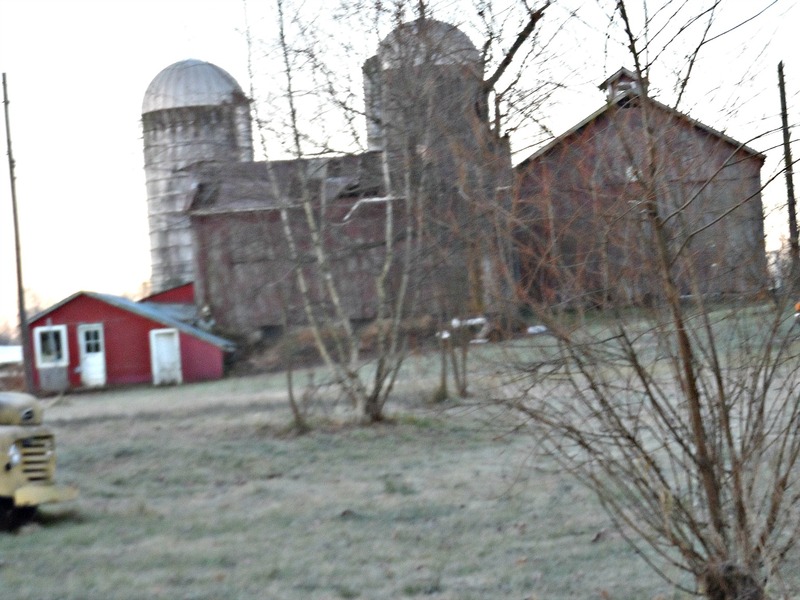 :-) Oh how I would LOVE to walk by an old farm like that on my walks! What a beautiful site. And antiques too? So perfect. 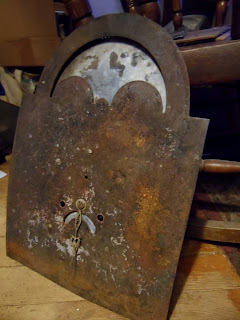 The dusty, rusty clock is fascinating....I wonder about its previous life and whose home it graced many years ago. Bepop is what my nieces call my father...love that! And what a wonderful find!! Beti, you really did take time!! How cool is that piece. I'm an empty nester without a job too! The thought of rummaging through such wonderful architechtural artifacts makes me giddy! I love the old clock piece, my grandfather built his grandfather clock ( sounds funny that way) and my favorite part was the moon that would go across the top back on that beautiful blue background. very cool post and piece! Love your doggie's name! So glad you found time to do something for you that led to the unexpected! I know several people who would have loved to have been with you on that walk...including me! Oh that looks like a real fun way to spend some time and a great interpretation of the prompt. What a cute name for your dog!!! I love your idea of taking time for yourself. Hunting and finding treasures like this can be very rewarding and fun!! How fun that must have been! I love searching out antiques of all kinds, and I haven't done it in awhile. That rusty, dusty timepiece must look wonderful in your room. What a great way to spend time for yourself. Oh, that's one of the most lovely pieces of 'uselessness' I've ever seen! And, you got some very cool photos of it too. Great way to take some time for yourself! Thanks for taking us along with you! I felt like I was tagging along. And the dusty, rusty clock piece is a true find! Very cool! I love finding dusty, forgotten pieces like that! Love the idea of having that piece in your living room reminding you to take time for yourself! Way cool! Oh, I love your literary taking the concept - great idea! And a wonderful visual prompt too. How fun! That looks like a great place to spend an afternoon. Oh, your treasures! Your old/new clockface seems like its just begging to be made into something new. What a great find! When I lived in Iowa and Missouri we used to go to estates sales a lot. Not so much here in Seattle. Thanks for sharing! Great piece and reminder to take time! That is amazing. I would have never guessed it was a grandfather clock. Beautiful finds! Wonderful! some good time for you indeed. I love having a mix of old and new in my home. Love to wonder about its former life. Very cool Beti. Through other bloggers I have developed a real appreciation for antiques and beautifully worn pieces that can only be found in places such as that farm. I am glad you have it in your living room as a constant reminder for you! Love your necklace with the furniture piece in it. I too am a country girl so I can relate to the farm pic. What fun to go and rummage around and find this interesting old time piece. I like how you say it reminds you to take time for you. Hi Beti, I think you had fun doing this. This is time for you and what a lovely piece you found to remind you to take time for yourself. That is great! I absolutely love it!!!! Cool find and a wonderful way to remind you to take time for yourself! What a great story of how you found the time to take time. I think the pendant you made is super cool. I love using old bits in necklaces too. They can be so inspiring. Fantastic! Love the symbolism and the antiquity of the timeless treasure you found. Beti! You've captivated me with your photos of old and rusty! I so love spending time with this stuff as well. That clock piece is just gorgeous. Love the post, I love going garage/thrift/antique shopping with my husband. It always amazes me what we find! These are great treasures and your pics are perfect! I love old rusty things. What great finds you discovered. I can see why you grabbed it for some reason it reminds me of the cow jumping over the moon! I can see the artwork on it - it's a great shape!